Freshness 'blindness' causes a lot of waste in produce supply chains. Here we explain the role of the Condition-based Expiration Date--a critical element to solving this problem. We look at what it takes to create a reliable and accurate algorithm that models deterioration of different varieties of produce exposed to different temperature histories. 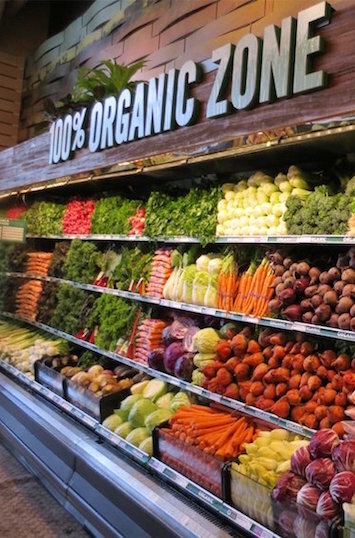 The produce supply chain has a big problem—‘freshness blindness’ across the entire chain. Visual inspection is standard practice to assess freshness of produce as it travels from field to shelf. But visual inspection doesn’t work very well. Visual freshness indicators are lagging indicators. Produce appearance only reflects visible deterioration, not remaining freshness, even when very few days remain to consume the product (see Figure 1). At the grower, everything looks fresh when loaded on the trailer. There is typically little or no visibility into how it has been handled up to that point. A grower may occasionally make a decision based on some known factor impacting freshness—for example, if they skimped on precooling some pallets, they may send that batch to the local market—but typically, growers are not using a consistent, product-condition measurement method to determine the actual remaining freshness when they make decisions about where to send the produce. The retailer also relies on visual inspection, resulting in low rejection rates but high return, mark-down, and throw-away rates. They usually will not know about inadequate remaining freshness until it is too late, as the product will already be at the store. The retailer needs to accurately know remaining freshness at the point of receiving the product. If spoilage only becomes evident at the store, or shortly after the customer purchases, it is too late. Post-purchase spoilage is especially damaging to a grocer’s brand and customer loyalty. Freshness of produce and other fresh food is the number one reason customers choose where to shop for their groceries. When produce goes bad shortly after being brought home, the shopper takes their business elsewhere. What is needed is a consistent, condition-based metric to accurately determine remaining shelf life and systems that use that knowledge to make the smartest decisions at each step in the cold chain. The freshness requirements for each of groups A, B, and C are derived by adding up component requirements. 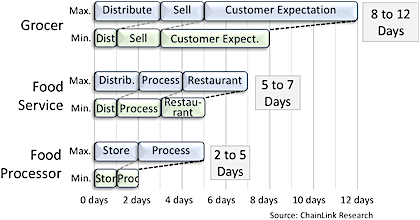 For example, a grocer may require 1-3 days to distribute to the stores from their distribution centers (DC), another two days to sell the product, and their customers have an expectation of 5-7 days of remaining freshness when they buy, hence the grocer requires 8-12 days of remaining shelf life at delivery. Institutional Food Service companies (e.g. Sysco, US Foods) may have 1-2 days distribution from their DC, two days to process, and 2-3 days at the restaurant, thereby needing 5-7 days remaining freshness upon receiving the produce. A good freshness management system will do all this math for you, once the right information has been entered. When growers lack visibility into actual remaining freshness, some pallets with maximum remaining shelf life will be sent to B or C customers, whereas some pallets with inadequate shelf life will be sent to A customers. As a result, the value of the longer shelf life pallets sent to the B or C customers is wasted, since those customers do not need, or value, that extra shelf life as they will consume the product in a few days, whereas an A customer needs that extra shelf life. At the same time, the A customer ends up returning, marking down, or wasting product that had inadequate shelf life for them, which a B or C customer would have been perfectly happy to accept and use. Now instead those pallets end up discarded, donated, or sold for pennies on the dollar at a terminal market. Every pallet has a ‘home’… i.e. a place where it will have full value when delivered. This ideal can be realized if the grower has three things: 1) visibility into accurate actual remaining shelf life, 2) knowledge of the transit times to each customer, and 3) an understanding of each customer’s freshness requirements. With those three pieces of knowledge, all pallets can be sorted and delivered to the right customer for full value. Unfortunately, lacking visibility into actual remaining shelf life, the majority of growers do not match pallet freshness to customer requirements. How bad is the problem? Industry rejection rates are typically 1%-2%, but soft claims (product spoiled before it got to the store) are 7%-8%, representing a major revenue recovery opportunity for growers. Retailers typically cull over 10% of what they purchase, and markdowns represent another 7% inventory impact for retailers. Those numbers could be substantially reduced, while at the same time dramatically increasing reliable freshness for customers, resulting in decreased waste and more satisfied and loyal customers. As mentioned, one of the main reasons more growers do not adopt the kind of methodology described above is they lack a way to accurately predict remaining shelf life within the first 12 to 24 hours after harvest (key to making the proper distribution decisions), so they simply assume all pallets (of a particular variety of produce) have equal shelf life, based on the date of harvest. That assumption is wrong. As explained in Pallet-level Monitoring: Maximizing Delivered Shelf-life in the End-to-End Fresh Food Supply Chain, the varying amounts of time different pallets spend in the field can result in three or more days variation in shelf life between those pallets. Add to these differences in completeness of pre-cool and other handling varitations, and pallets of the same produce variety harvested from the same field on the same day, can have shelf lives that vary by as much as a week, even before they have left the pack house. The problem is compounded when pallets travel through a multi-echelon distribution system, as decisions are made at each node without knowledge of the actual remaining shelf life of each pallet. What the industry sorely needs is a normalized freshness metric—more specifically, a Pallet-level Condition-based Expiration Date—one that is much more accurate than the traditional expiration date stamped on packages at the time of harvest. The traditional approach is a static date that ignores temperature exposure history and other conditions affecting shelf life. A Condition-based Expiration Date is dynamic, based on temperature exposure and other conditions such as location of harvest, condition at harvest (weather, ripeness), and time of season. Each time the Condition-based Expiration Date is referenced, it is re-calculated, based on the temperature exposure history up to that moment. It is also tailored to each product variety and field location, as each variety’s response to these conditions differs. Thankfully, there is an affordable system available that provides accurate estimates of the actual remaining shelf life of each pallet of produce. Zest Labs has developed a solution comprised of devices, software, methodologies, and algorithms that take into account the product type, variety, the specific location (field or lot number) of harvest, harvest conditions (weather, ripeness2/maturity level), time of season, and most importantly, temperature exposure history. Each pallet has its own unique history of temperature exposure in its end-to-end journey from field to shelf. That is by far the single biggest determinant of freshness.3 Therefore, to get an accurate measure of remaining shelf life, the temperature history of each pallet of produce must be monitored, from the time it is harvested in the field, until the end of its journey when it is delivered at the store.4 However, temperature history data by itself is not enough. An algorithm is required to accurately calculate the actual remaining shelf life of each pallet, based on a combination of pre-harvest factors, harvest conditions, and its temperature exposure history to-date. Zest Labs calls its Pallet-level Condition-based Expiration Date a ZIPR Code. It takes into account harvest location and conditions, and is adjusted5 as a pallet of produce is exposed to various temperatures throughout its journey from field to shelf. Two pallets picked on the same day, from the same field, but which are then exposed to conditions that are different enough, will end up having different ZIPR Codes, accurately reflecting the actual remaining shelf life of each pallet. The Condition-based Expiration Date must be tailored to each produce variety if it is to have any validity and accuracy. Of the tens of thousands of varieties of fruits and vegetables grown in the U.S., about 500-1,000 varieties comprise the majority of what is sold in grocery stores and restaurants. In order to convert a temperature history of any one of those into an accurate remaining shelf life estimate, someone has to develop temperature response profiles for each of the various varieties. This requires testing and observing how each variety responds when exposed to different temperature histories. Zest Labs has done (and continues to do) the required testing and modeling of response to different temperatures for different varieties for each harvest location. Temperature response profiling requires an objective measurement of what constitutes the end of shelf life for each variety. For grocers, this comes down to two moments of truth: 1) buy decision—when a shopper examines the produce and makes a decision whether it is fresh enough to buy, 2) eat/throw decision—later at home, does the produce stay fresh enough, long enough for the shopper to satisfyingly eat it (or if they have to throw it, has it been long enough that they don’t expect it to still be fresh, so they don’t blame the grocer). These subjective decisions, ‘would I buy it’ and ‘would I eat it,’ need to be converted into an objective measure6 of freshness. This is done by building up a body of knowledge about specific objective measurements, such as number and size of spots, measured firmness, color changes, and other signs of deteriorating freshness that are specific to each variety. The system needs to be very specific about translating these measured freshness indicators into what is and isn’t acceptable; i.e. what constitutes the end of useable shelf life. This also serves to capture and institutionalize this knowledge. 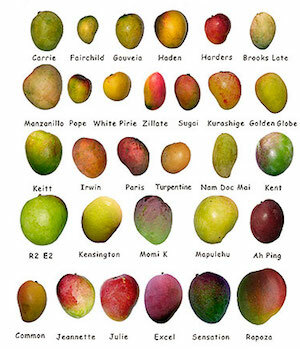 Instead of relying on a few quality control experts, who can only be experts in a few dozen varieties anyway, knowledge of hundreds of varieties is encoded in the system. Developing a temperature response profile for a variety of fruit or vegetable requires a methodical approach. Zest Labs takes samples of each specific variety right from the grower at the time of harvest over a period of time during the beginning, middle, and end of the season. These samples are brought to their lab to be stored at different temperatures. The samples are photographed and evaluated daily, using specific objective criteria. 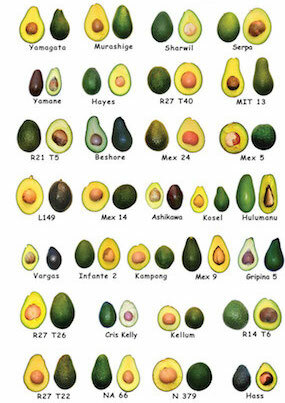 Different varieties spoil in different ways so the criteria are specific to the variety. The freshness criteria are developed through interviews with produce managers at the growers and quality control managers at the retailers, asking them what specific criteria they use. These criteria may vary by chain, region, and store. Through these interviews, a consensus criteria is reached. 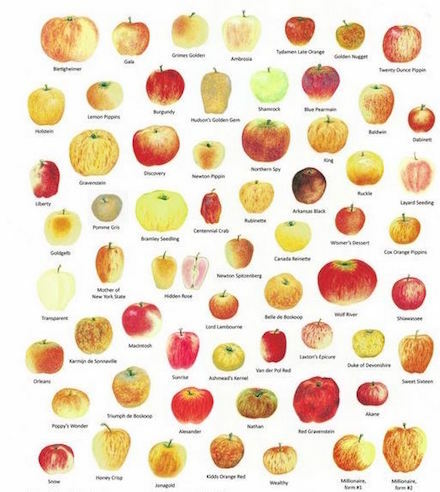 The subjective criteria (‘this one has too many spots,’ ‘the color is not quite right’) are then translated into specific measurable objective criteria in a normalized rating from one to five (for example, 10-15 spots might be a two rating for a specific variety of fruit). From this, Zest Labs is building up a database of intelligence about how long different varieties stay fresh (according to the specific freshness criteria used in the industry) under varying temperature conditions. This approach also discovers how each variety’s temperature response profile changes when it is grown in different locations and/or harvested at a different level of maturity or time of the growing season. Zest Labs’ knowledgebase is continually expanding as new varieties are tested, and deepening as the same varieties are tested in different seasons, locations, and conditions. There is no other solution provider that we are aware of making anything close to that kind of investment and building up that knowledgebase. For the highest volume varieties (the 20% of produce that comprises 80% of the volume), Zest Labs also has its retail customer’s quality control (QC) expert conduct testing at the retailer’s DC. The QC person takes pictures every day, using the same mobile application used in Zest Labs’ lab. In this case they are observing the condition of the produce in real world scenarios, having tracked the temperature exposure of each of those pallets from the point of harvest. Zest Labs correlates observations of these ‘retention samples’ back to what it is seeing in its labs from the growers’ samples. This includes observing which symptoms prevail first (e.g. decay, spotting, wilting). Zest Labs may also have the produce manager in some of the retailers’ stores use the same application to check the produce again at the store. This helps the retailer dispel the common myth that the real problem is in the handling of produce at the store. People tend to blame the workers at the place where the item spoils, but the data shows that often it was going to spoil anyway, no matter what the store did. This knowledge directs attention to where the real problem is—delivered freshness. The point is not to blame the grower, but diagnose the problem and give both the grower and the retailer the tools to fix it. In part two of this series, we will look at the role of process mapping in deriving accurate customer requirements, the need for a prescriptive system driving operations across the cold chain, and the benefits of a freshness-aware, intelligent cold chain.